The APH is a Hannover-based club of amateur paleontologists founded in 1972. Meanwhile the APH has grown to a membership of several hundred and publishes its own journal. The club organizes monthly meetings and frequently offers excursions, not only to the Campanian outcrops described here, but also to other North-German localities. More information may be obtained at the APH-Site. Ralf Krupp is a geochemist who got interested in the prolific occurrences of Campanian fossils right next to his residence. The present website is an effort to make some of the finds and findings available to a wider community of interested amateur and professional paleontologists. 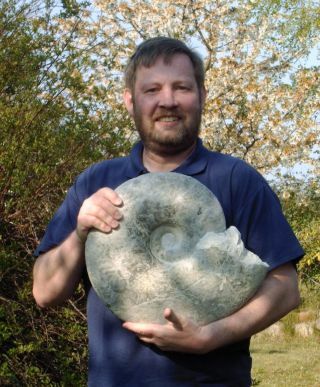 The author does not trade with fossil specimens on a professional basis. However, depending on availability, the author is prepared to give away surplus material, e.g. for display, teaching or study purposes. In this event, it is expected that the recipient takes over all shipment costs and makes an appropriate donation in support of this website and the underlying work.